U.S. Army troops install razor wire atop the U.S.-Mexico border barrier in Nogales. Mayor-elect Arturo Garino says the wire does not give a good impression of the border area. 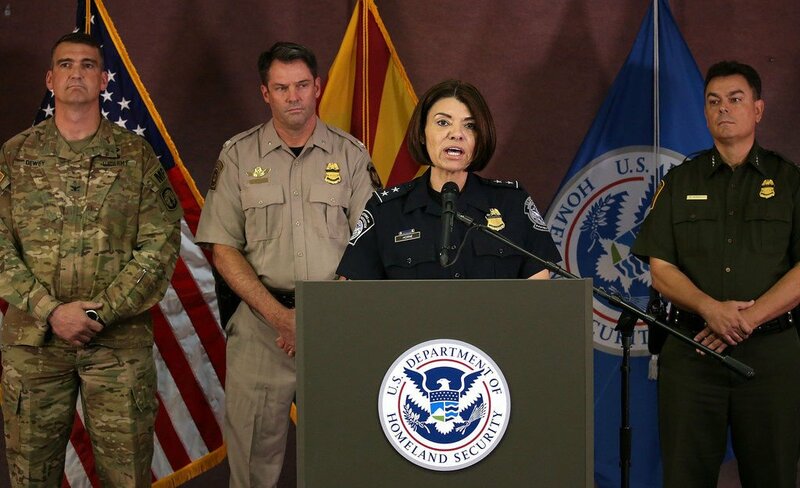 Petra Horne, acting director field operations with Customs and Border Protection Tucson Field Office, joins Department of Defense and CBP officials to update the media on the U.S. Army's support of Operation Secure Line at the DeConcini Port of Entry Nov. 9, 2018, in Nogales, Ariz. From left are Col. Larry Dewey, commander of the 16th Military Police Brigade, Jessie Scruggs, acting deputy director of aviation operations with Tucson Air and Marine Operations, Horne, and Rodolfo Karisch, Border Patrol Tucson sector chief. The Army recently installed concertina wire atop the fence extending both directions from the port. Vehicles queue to enter the United States from Nogales, Sonoita, at the DeConcini Port of Entry Nov. 9, 2018, in Nogales, Ariz. Customs and Border Protection officials pointed to the yellow strip to show how easy it is to go from being in Mexico into the United States. ﻿Nogales, Ariz., Mayor Arturo Garino discusses his tour with Homeland Security Secretary Jeh Johnson after they visited the Nogales Placement Center for unaccompanied children from Central America. U.S. troops are topping the border fence with razor wire near ports of entry in Arizona to prevent migrants in caravans from storming in as some did at the Guatemala-Mexico border, officials said Friday. “I think everybody saw what happened on the Mexico-Guatemala border, where Mexico was in fact offering asylum and they still rushed through the border. So we have to prepare for that eventuality,” Rodolfo Karisch, commander of the Joint Task Force-West, said during a news conference Friday at the DeConcini Port of Entry in Nogales. Karisch is also chief of the Border Patrol’s Tucson Sector. Some migrants in the groups traveling north burst through the Guatemalan border fence and clashed with Mexico riot police trying to keep them from crossing last month, according to news reports. About 1,500 U.S. troops have been deployed to Southern Arizona to support Customs and Border Protection in Operation Secure Line, in preparation for the potential arrival of large groups of Central Americans making their way slowly through Mexico. Borderwide, about 5,600 troops have been sent and future deployments could exceed 7,000, as part of what was previously called by the Department of Defense Operation Faithful Patriot. The troops include military police and engineering troops who can help build vehicle barriers and other fencing to strengthen different parts of the border, especially around legal crossing points. Others are here to help with maintenance, transportation and logistics to move materials, and Black Hawks will move agents to remote locations. Medical and planning support staff are also prepared to assist as needed, said Col. Larry Dewey, senior mission commander of U.S. Army forces supporting CBP in Arizona. “Our mission is not to stop the caravan of migrants,” Dewey said, but to support CBP. Based on total costs of previous National Guard deployments to the border, Adam Isacson with the Washington Office on Latin America, estimates a $302 per person, per day cost, which for 7,000 troops, he said, would be about $2.1 million a day. As of Thursday, Petra Horne, acting director of field operations, said there were several thousand people in Mexico whom U.S. government officials were monitoring. “The status quo is not sustainable,” even without talking about the caravan, he told reporters. Tucson Sector agents apprehended about 1,100 parents and their children in October, up from 170 during the same period last year. During Friday’s news conference, the first since the troops started to arrive last week, officials emphasized that those seeking refuge should present themselves at ports of entry in an “orderly and peaceful” fashion. Michael Humphries, port director in Nogales, took a small group of reporters to the vehicle lanes of the port of entry to show how the U.S. and Mexico are divided by a strip of yellow bumps and that it is easy to go from being in Mexico to the United States. Officials are already seeing groups running through the vehicle lanes, Horne said, and wanted to get the message out in advance. Those who cross the border illegally, which includes running through the vehicle lanes at ports of entry, will be arrested, officials said. Since this summer, ports of entry have been facing increasing lines of mostly families and minors traveling alone waiting to seek asylum, with officers at times telling them to come back because they can’t be processed. While the wait times and the number of people camping outside the Nogales port of entry have fluctuated, until recently people were waiting up to a month, said Joanna Williams, who is with the binational Kino Border Initiative. The wait has dropped to about 10 days. On Friday morning, she said, about 20 people were allowed in to be processed. The number of people who can be processed on a given day depends on the number of officers available and what else is going on, such as drug smuggling attempts or people presenting fake documents, Humphries said. “We have to balance our duties and responsibilities every single day,” he said as he walked reporters through the pedestrian crossing lanes and the holding cells where those coming through are taken to be processed. On Friday, there were about 50 people from seven countries, most from Central America, but a few from Brazil, China, Mexico, Kyrgyzstan, and a U.S. citizen child whose parents were unauthorized. The majority were parents with their children being held in a handful of group cells stocked with green mattresses and space blankets. Six unaccompanied minors were held separately in a penlike area. There were also two individual cells, one holding a felon and another one a juvenile parent with a child. A few other mothers and their children were kept apart in a sort of hallway due to medical reasons, officials said. A Minions movie played on TV as a handful of customs officers behind a computer processed the families. The officers take biographical information and open a case file before the case is transferred to Immigration and Customs Enforcement. “We are preparing for large numbers of people,” Humphries said, pointing to a pallet of “Zoo” animal crackers. There were also boxes of cereal and, he said, they were stocking up on diapers and baby formula. Horne said CBP has additional support of 1,000 employees ready to deploy in addition to 250 special response team officers, some of whom have started to arrive at land ports of entry and will be ready to deploy if needed to help process asylum-seekers. Various reports, including from the government, have showed that the long wait times and being turned back at ports of entry have led to some families and minors attempting to cross illegally to turn themselves in to Border Patrol agents. Officials are also allocating resources to facilitate legal trade and travel, Horne said, which she called the lifeblood of the shared community. Residents, too, have been reporting longer wait times at the pedestrian and vehicle lanes. He said it does not give a good impression of the border area nor is it good for the economy of Arizona or Sonora. “Instead of getting Christmas lights, we are getting razor wire,” he said. While what happened on the Mexico-Guatemala border was not good, he said, the situation here is different. Contact reporter Perla Trevizo at 573-4102 or ptrevizo@tucson.com. It's affecting business and travel, but being misunderstood and mistreated by faraway authorities is part of border life.